We offer various PLC modules and it's spares for PLC Panels fo industrial purpose. Machine Automation Controller is designed to meet extreme machine control requirements and enables logic and advanced motion control in one. 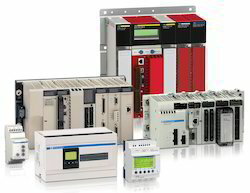 Shree Krupa Automation Systems Pvt. Ltd.
Safety Controllers form the core of the system when building safety circuits for equipment and facilities. Appropriate circuits can be configured to enable fail-safe systems, as well as to facilitate detection of input and output faults. Programmable Logic Controllers (PLC): Low cost Built in 4X18 characters LCD display PLC along with 5 keys on front panel. Used for Compressor management, Green Houser, Motor control, 12VDC PLC for AMF panels, etc. From the first day of our establishment, we provide the handpicked quality of Siemens S7-1200 PLC Automation System. In addition to this, the quality of the rendered products is always maintained.